Conekt is Farpointe Data’s mobile smartphone access control ID solution—consisting of a smartphone wallet app, mobile and physical credentials, and combination Bluetooth Low Energy (BLE)/contactless smartcard readers. Based upon the proven LEGIC® contactless digital radio frequency identification (RFID) platform, Conekt readers interface with a wide range of electronic access control systems by complying with either the legacy Wiegand or bi-directional Open Supervised Device Protocol (OSDP). In addition to supporting mobile access credentials, using the BLE feature of select smartphones, Conekt includes a range of traditional physical access credentials, such as clamshell cards, ISO cards, and key tags. 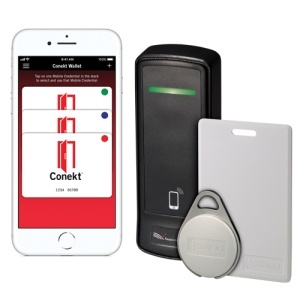 Featuring easy registration, convenient mobile credentials, and multi-technology readers, Conekt is the next-generation ID solution for your electronic access control systems.